Haws pedestal drinking fountain 3380FR uses a subterranean freeze resistant valve assembly to provide year round operation. Our fully engineered pneumatic valve systems are some of the best in freeze resistant technologies. The fashionable barrier-free design of the 3380FR allows the circular pedestal to be placed securely in multiple locations without taking up excess space. Equipped with vandal resistant components, this water fountain is not easily disrupted, quickly discouraging the worst of vandals. 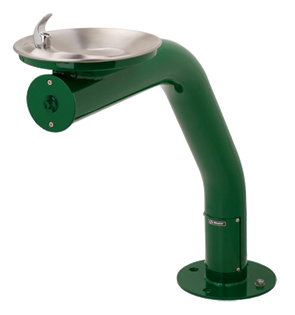 Heavy-Duty 11 gauge thick steel with green powder-coated finish provides an exceptional corrosion resistance in one of our toughest made fountains. Now Requires the 3380FR or 3380FR-CC and one of Valve Systems (Model 6518FR) Listed Below (Sold Separately) for a Complete Unit. Model 3380FR - Round Pedestal (Freeze Resistant) Drinking Fountain with Round Sculpted Bowl. 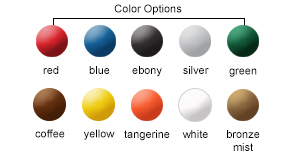 Model 3380FR-CC - Round Pedestal (Freeze Resistant) Drinking Fountain with Round Sculpted Bowl Custom Color. Model 6518FR - Valve System (Freeze Resistant) fully engineered pneumatic operated valve. 18 gauge Type 304 Satin Stainless Steel Basin with Integral Swirl Design. Polished Chrome-Plated Brass Push-Button, Bubbler Head, and Waste Strainer. Powder-Coated 11 gauge Galvanized Substrate Steel Pedestal. Meets Current Federal Regulations for the Disabled Including Those in the Americans with Disabilities Act.